Gender segregation by occupation is the tendency for men and women to be employed in different fields. Occupational segregation is caused by gender bias based on stereotypical, biological and social differences between the two. There have been two types of gender segregation identified: horizontal segregation and vertical segregation. Horizontal segregation will be the topic of discussion. 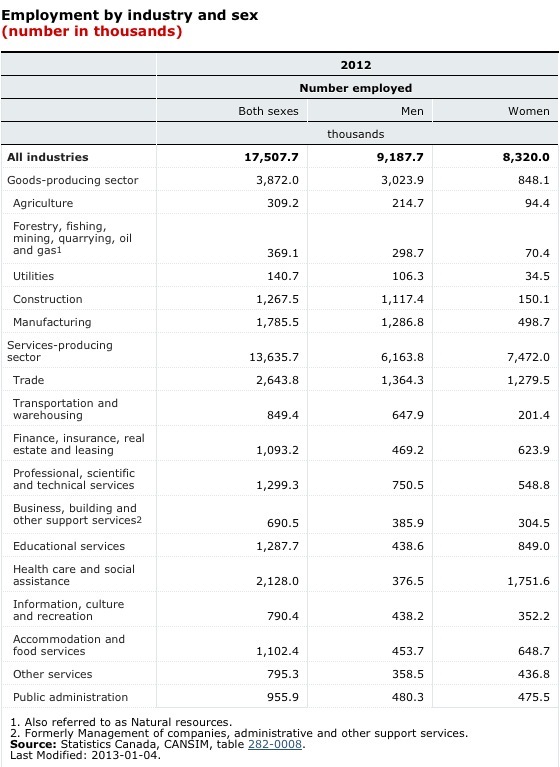 This occurs when the workforce in a specific occupation is comprised of primarily of only one gender. For example, currently in Canada only one in every twenty nurses are male. The evidence of over-or-under representation of women in a particular field has been tracked by Statistics Canada. This data comes from Statistics Canada’s “Labour Survey”. The over-or-under-representation of women is clear, particularly in health care-social assistance and technical services. Many would argue that this division was in part caused by “age-old tradition” where men and women were responsible for specific, different tasks. Women are perceived as having a nurturing personality; your mom was probably seen as the more qualified person to be the primary caregiver to you as a child. Males are seen to be better suited in fields requiring physical strength, such as construction. The social perceptions associated with specific tasks are directly responsible for the gender segregation seen in many industries. Nursing, for example, is a highly respected job. It is not in any culture stigmatized but it is strongly gendered. Nontheless gender segregation can have a stigma associated with it, and these socially established patterns may also significantly influence women’s perceptions of their own occupational abilities. According to authors Lesley Andres and Maria Adamoti-Trache of You’ve Come a Long Way, Baby? Persistent Gender Inequality in University Enrolment and Completion in Canada, 1979-2004 gender segregation related to post-secondary education has remained remarkably stable declining by only 5% in the last 25 years. This suggests that differing structures of opportunity within higher education perpetuate gender inequalities in the labour market. 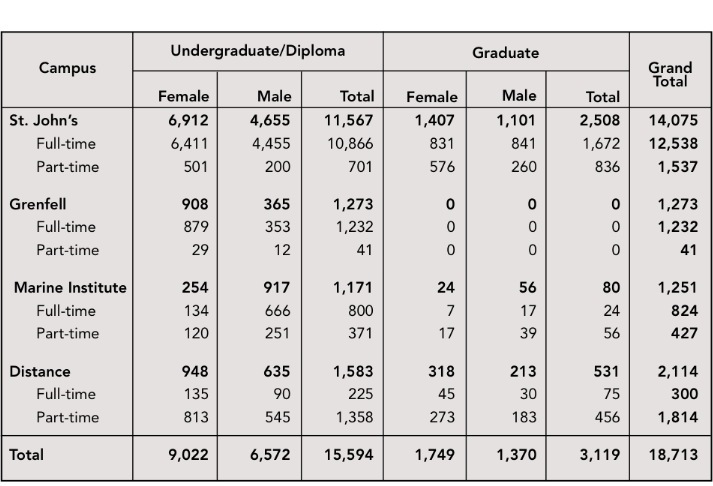 Memorial Universities 2011-2012 enrolment data provides evidence towards this decrease. With 2,450 more women than men enrolled in undergraduate programs that year, under-representation of women in engineering and certain fields of science still occurred. This problem indicates the differing opportunities in higher education. Achieving gender equality in higher education by reducing occupational segregation should be a goal in Canada. For women to achieve this in universities, policy measures are needed, but so are practical and imaginative ideas as well. By encouraging women to diversify their choices in higher education and by universities providing such opportunities specifically for them would ultimately have a positive effect on the occupational segregation. Many students choose to go into fields based on their experience in high school, so successful university initiatives should build on work in K-12. Memorial University has taken the initiative to create change. WISE (Women in Science and Engineering) is non-profit, volunteer organization that aims to increase the participation of women in thse fields by creating awareness that these professions are rewarding and exciting. This organization also provides mentoring, professional development and networking opportunities. WISE SSEP provides an eight-week summer internship for grade 11 female students across the province; these students are matched up with meaningful research that is being carried-out by the university. WISE SSEP offers an eye-opening experience for young females,with the vast career opportunities. Active solutions that challenge traditional gender norms are certainly part of the solution to occupational segregation.